After a whirlwind vacation planning spree and a wonderful 5 day vacation, we're back and getting back to our "normal" routine. Our trip started with a quick visit from my parents and older sister, joining us for a few hours (literally 3 hours) in the Magic Kingdom. 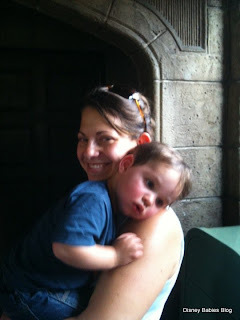 Maybe some of you remember that I couldn't decide between the Magic Kingdom or EPCOT - want to know how I decided? That's us in the back row! Of all the rides - this is the one that I really want to share with Adam. Okay, maybe Soarin', too.. but Splash Mountain makes me want to sing and share the great story with my husband! We discovered 1 MAJOR difference *more to come* between 6/12/18 months - Noah did not like the opening room of the Haunted Mansion. He's never shown fear of the dark, but the room with the stretching ceilings scared him both times we went on the Haunted Mansion. Just something to think about if you're going with toddlers! He was fine on the ride, but those ceilings caused a fright! And - without a picture of my meal - I actually had a fantastic-for-counter-service Beef and Blue Cheese Salad. I was very impressed with my meal! After the long day of traveling, we had an early night - headed back to our resort - the Grand Floridian - and called it a night around 8 p.m.
FYI, my little guy still didn't like the room at almost 2 and a half... Sounds like the rest of your day was wonderful though! Travel Tip Tuesday - Creating a Mountain! Reader Questions - Car Seat or No Car Seat?